Do you want to make a difference? Do you live within King County? Do you have a spare bedroom? 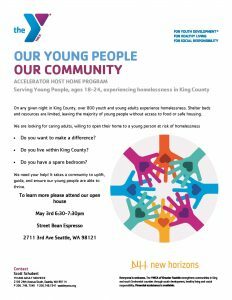 In partnership with Accelerator YMCA’s Host Home program, we’re looking for caring adults who are willing to open their homes to young people without access to food or safe housing. To learn more about this unique opportunity to engage with homelessness in our city, attend our open house event on May 3rd at Street Bean Coffee Roasters in Belltown.